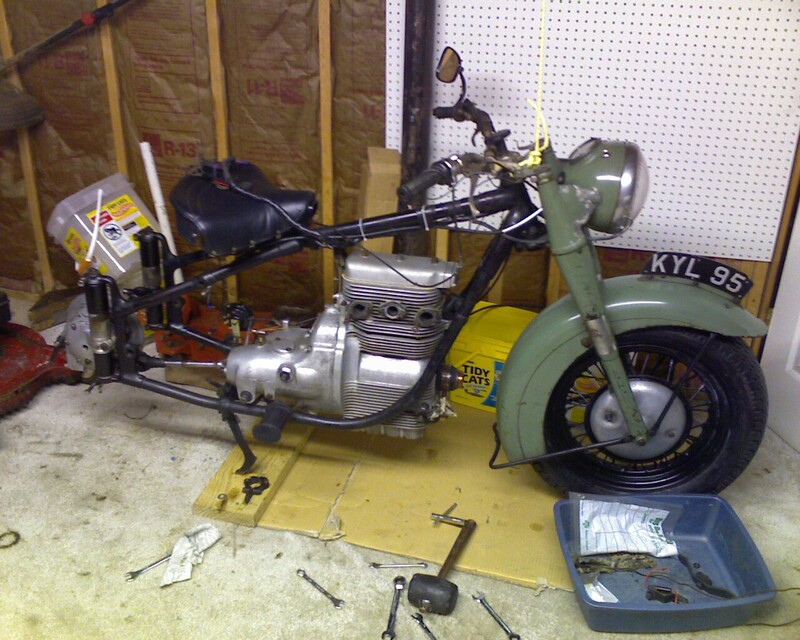 Thanks to the assistance of my wonderful wife, the engine is back in the frame where it should be. I took the heavy part, she took the light end, and we dropped it down onto the rubber engine mounts. I have to bolt everything together yet, but its still progress. The folks at J&J Cycle Barn in Manchester, PA were kind enough to put an inner tube in the rear tire for me after I gave up after it burst the second time. Thanks to Joe and Jenny. The next step will be mounting the exhaust, fitting the elbows, wrapping the exhaust header with fiberglass tape (to hide all the welding patches I made). After that all the electricals need hooked back up, and the carb fitted. Ahhh the carb. The slide is too worn and it goes lean. I'm sure of it. Still waiting for the replacement slide from England. Poor fellow sent it in the mail a month ago, not sure if its lost, or stuck in customs. I've never had to wait so long.... I'm afraid its lost.